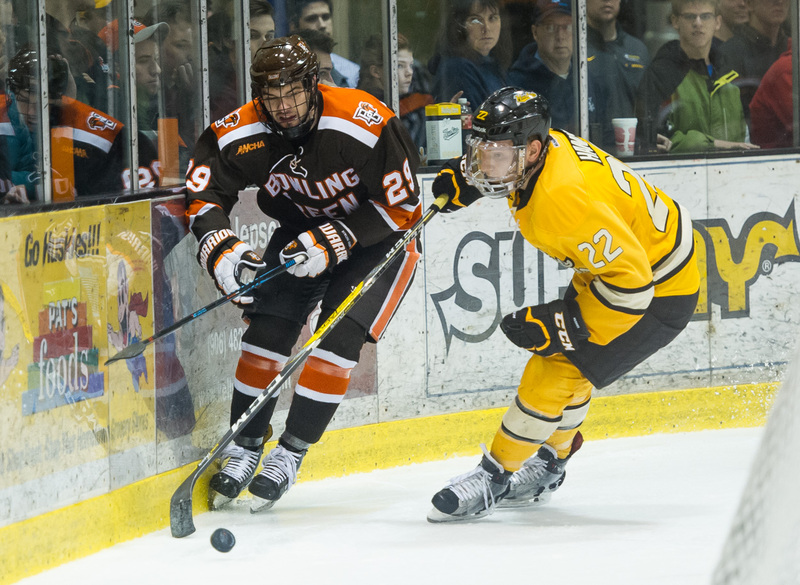 Bowling Green's John Schilling (left) and Michigan Tech's Shane Hanna compete during Saturday's championship game of the Western Collegiate Hockey Association playoffs (Photo by Todd Pavlack/BGSUHockey.com). HOUGHTON, Michigan — Bowling Green suffered a heartbreaking end to its season Saturday night in the championship game of the Western Collegiate Hockey Association playoffs. The Falcons lost a 3-2 double-overtime decision to Michigan Tech. Shane Hanna’s breakaway goal 6:35 into the second extra period gave Tech the win and the league’s automatic bid to the NCAA Playoffs before a capacity crowd of 4,466 in the MacInnes Student Ice Arena. BG rallied from a two-goal deficit in the third period to force overtime, tying the game on goals from Joe McKeown at 6:36 and Matt Pohlkamp 24 seconds later. But Hanna’s goal ended BG’s hopes of earning its first trip to the NCAAs since 1990. 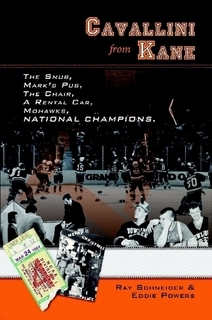 The Falcons, who won the national championship in 1984, were playing in a league-championship game for the first time since 1988 when they won the playoff title in the now-defunct Central Collegiate Hockey Association. BG and Tech treated the raucous crowd to a terrific game that lasted just under four hours. The three-hour, 40-minute contest went 26:35 into overtime. BG finished 21-18-2 overall, while Tech improved to 23-14-7. The Huskies are headed to the NCAAs for the second time in the last three seasons. They received an at-large berth in 2015. The Falcons saw their seven-game winning streak ended, their last loss coming Feb. 4 at home against Northern Michigan. The seven-game winning streak was their longest since the 1987-88 season when they also won seven straight. BG won 16 straight during the 1986-87 season. THE WINNER: Hanna’s goal came after Tech caught BG on a bad line change that left the Falcons with just three skaters in the play and their fourth skater was just coming off the bench. The teams were skating 4-on-4 because of matching minor penalties. Hanna took Matt Roy’s lead pass in stride behind the BG defense and just outside the BG blue line. The senior defenseman and second-team All-WCHA honoree beat Nell with a laser over the glove high to the top, right corner of the net. Roy had possession of the puck at the top circles in his defensive zone and threaded a perfect pass up through the middle of the ice. Hanna’s goal was his eighth of the season and 21st of his career. “I do that a lot in our shootouts when we do it on Thursday in practice, and I went with what I knew,” Hanna said of his shot. MORE HANNA: Hanna didn’t play in the first overtime because of an undisclosed injury. “I was excited to get out there and contribute, and it worked out,” Hanna said. COMEBACK: The Falcons played well early, and the game eventually settled into a thrilling exchange of scoring chances through the end of the second period. Tech took its 2-0 lead in the second period on goals from Joel L’Esperance at 4:53 and Jake Jackson at 12:25. But the Falcons rallied with a dominant third period, including an 11-2 edge in shots on goal. Tech didn’t have a shot on goal in the third period for the first 16:24. BG played most of the period in its offensive zone. “We knew this potentially could be our last game,” BG senior captain Sean Walker said. “We had ample opportunities to keep scoring. We knew if we stuck to our game plan we were going to score some goals. We had tons of chances. The Falcons solved Tech twice, even though the Huskies are fourth nationally in goals allowed (2.16 per game) and second in shots allowed (23.4 per game). BG’s two best chances in overtime resulted in a glove save by Redmond and a shot that hit the post. THE GOALS: The Falcons’ first goal came from in front when McKeown finished off an excellent shift with linemates Tyler Spezia and McLain. McKeown scored from in front of the net. Pohlkamp knocked down Redmond’s clearing attempt in the right corner, skated to the net and back-handed puck into the net falling down from the right side of the crease. “They gave us more than we could handle,” Pearson said. “The worst lead in hockey is a two-goal lead. We just sat back, but they pushed us. They came hard. We were on our heels. The first goal gives a team momentum. It gives them a spark. “We had tons of guys who were cramping up, so the pace slowed down a little bit,” Walker said. PENALTIES: The teams played a physical contest, but only six penalties were called. All of the penalties were minors, three to each team. Both teams were 0 of 1 on the power play. There were two sets of matching minors. THE LEAD: L’Esperance opened the scoring with a 2-on-1 rush after BG turned the puck over just inside the blue line. The Falcons’ also did a poor job of backchecking and failed to pick up L’Esperance. Jackson’s goal came from just above goal line on the left-wing side. The shot went in just inside the right post. He originally came in from the right point and skated around a BG defenseman who was going to block his shot. But Jackson faked the shot, maintained possession and waited for Nell to go down to the ice. Jackson gained possession after his pass earlier during the possession hit a Falcon player and went back to him. The two BG defenders on the play then collided. REMEMBER ME: Gary Kruzich, the starting goalie on BG’s national championship team, is in his first season as the director of athletic partnerships and ticket sales. “I’m definitely rooting for the Huskies,” Kruzich said prior to the championship game. “But I’m human so there are mixed emotions. Just looking up in the stands and seeing orange brings back a lot of great memories of my time in BG. Kruzich finished his career as the NCAA career leader in victories in 88, although the record has since been broken. He was a first-team All-American his final two seasons and remains 10th in career save percentage at BG (.889). Kruzich started his position at Tech in October. FAREWELL: The loss ended the career of BG’s five seniors — Walker; forwards Pohlkamp, Pierre-Luc Mercier and Kevin Dufour; and goalie Tomas Sholl. The Falcons were 84-58-19 overall and 60-49-13 in the league the last four seasons. All five have grade-point averages of 3.0 or better, and will graduate in May. After losing twice to NMU at home Feb. 3-4, BG won those seven straight games to reach the 20-win mark for the third straight season. The Falcons also won a first-round playoff series for the seventh straight season. LINEUP: The Falcons’ lineup consisted of 12 forwards and six defensemen, instead of the 11 forwards and seven defensemen they’ve been using of late. Forward Jakob Reichert and defenseman Jacob Dalton were healthy scratches, while forwards Matt Meier (upper body) and Casey Linkenheld (lower body) remained out with injuries. TRAVEL: BG flew to Houghton via charter Friday morning and was scheduled to return home Sunday morning.